Every scientific in-situ experiment and also probe sampler need an infrastructure in addition to the actual front-end instrument, which delivers the instrument to its dedicated target and also provides a support function, i.e. by realizing power supply, data exchange, commanding as well as mechanical and thermal support. The system infrastructure is the supporting element between a multitude of instruments and the user/scientist and is also realizing a connection between the user and the hazardous environment. Some of these infrastructural elements are independent from their environment and can have a common development for space as well as for the deep sea (e.g. 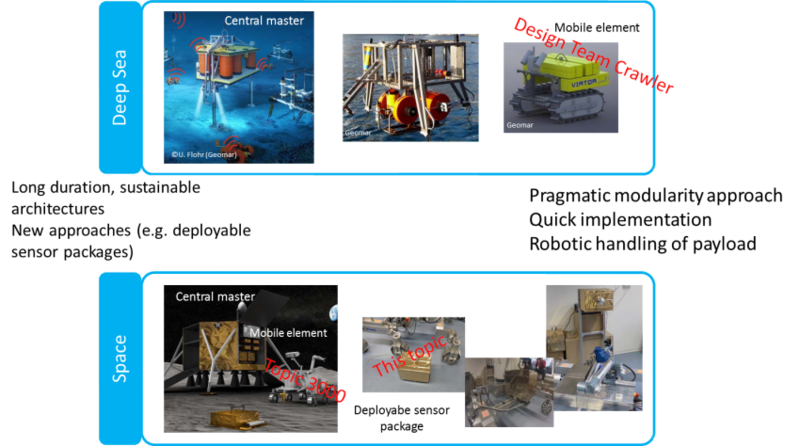 energy management, data management or networking between several instruments) In both environments, infrastructures have already been realized which can be either mobile (lunar rover vs. AUVs in the deep sea) or stationary (lunar landing platforms vs. ocean bottom lander or in combination of both. New within ROBEX will be an enhanced autonomy, reconfigurability and modularity of the systems as well as a standardization of the interfaces.